We never know what will happen in life. Insurance agents are always trying to sell you a policy that will protect your interests in the future, but often we are reluctant to purchase, saying to ourselves, “That won’t happen.” Then, sometimes it does. Air quality is sort of like that. We breathe air every day and it’s fine, right? 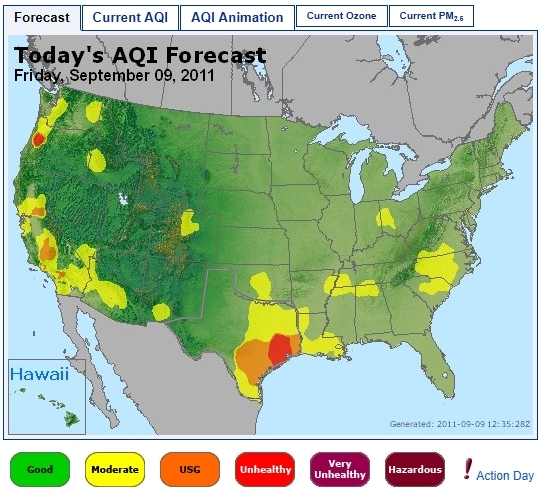 Below is the forecast for the air quality across the US for today (9-9-11). Our area of Texas is the red spot down at the bottom. We needed to buy that insurance policy. Health is a very complex issue and an individual can only be so mindful of their own health practices. Our larger society and the decisions made by those larger groups affect us all. The recent wildfires have shown one aspect of how our future is impacted by how mindful we are in the present moment.